In between their Taekwondo matches, the opponents take a breather and fill up on a protein bar that will keep their energy level high for the next confrontation. Having no time to sit down for a proper nutritious meal, this serves as their only source of energy. But while her opponents munch on their bar, Bat-El Gaterer, the only Taekwondo delegate to the 2008 Beijing Olympic Games, adds hot water to her kosher instant noodle cup made in Israel. It’s not that Gaterer has a poor taste in food. It’s just that it’s so hard to find a kosher protein bar, and if it means she has to make do with a cup of instant noodles full of MSG, than that’s what it’ll be. That’s how it goes when you’re the only religious contestant in the entire Israeli Olympic delegation. Gaterer’s coach, Noa Shmida, wished to clarify what may seem to the average reader as a curious jest: “Athletes keep a very strict dietary regime, which is even more critical when the type of sport requires measuring and calculations of muscular mass. “Bat-El arrives at the competitions after having consumed junk food such as those instant foods, which have an affect. As someone who is in charge of her nutrition, I regret that she cannot consume healthy food – but she has her own faith and will not compromise. Gaterer’s uncompromising nature reaches far beyond kosher matters. Her coach recalled a Taekwondo competition held in Belgium for which the Israeli delegation scraped to find a single hotel room close to where competition was held so that Gaterer wouldn’t have to walk all the way there on Shabbat. Taekwondo is a Korean martial art primarily based on footwork. In its competitive version, it is a kicking match awarding one point for kicking the rival in the stomach and two points for hitting him in the head. After three rounds of two-minutes each, the one accumulating the highest point score is the winner. Eight years ago, Taekwondo became an official Olympic sport, and the 2008 Beijing Olympic Games is the second time Israel sends a Taekwondo delegate. Twenty-year-old Gaterer grew up at the Kochav Yaakov settlement not far from the West Bank city of Ramallah. At the age of nine, she registered for a street fighting class and her coach suggested she focus on footwork. 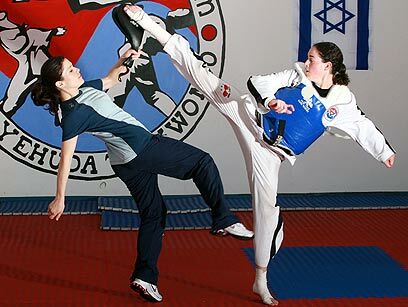 Recognizing her potential, he referred her to the Achi-yehuda Dojang club and its team in Jerusalem. Gaterer began learning Taekwondo when she was 12 and hasn’t stopped kicking since. While studying at the girls’ seminary in Ofra, she also started training with Israel’s national team. “Everyone at seminary accepted it (Taekwondo practice) and supported me,” said the Olympic delegate. Shomrim could use her services. now this is something I'm sure all bais yakov and bais rochel girls can be proud of bravo! not. or may i say it "a real cilul hashem"
If all B'Y' and B'R' girls were trained in self defense we would have much less to worry about when are daughters are out on the streets. Yankel, di volst memeile nisht geshikt kan bais yaacov oder bais rochel, since your busy with the stmerer shite (peres article). I suppose it's all right for girls to learn martial arts to protect themselves, but, to perform in public in front of men (even dressed fully covered) is a breach in Tznius. I hope this sweet Jewish girl, who is concerned with keeping Shabbos and Kashrus, will grow in her Yiddishkeit and give up her competition in the Olympics one day and settle down to become a frum aidle aim b'Yisroel. Why is it a chillul Hashem? I think it's a kiddush hashem. Just because it isn't something you want your daughter doing doesn't make it a chillul hashem. What exactly is a chillul hashem about this??? Would you prefer she doesn't keep kosher? I don't understand why she has to keep the diet she is on. There are plenty of kosher protein bars out there, and why does she need to eat junk food? There isnt enough kosher regular food? isnt it a shame that the whole jewish world doesnt think like everyone in boro park and williamsburg, because over there they are perfect. Everyone else is wrong and doesnt know what their doing. I don't know about you but I hope she comes home with something! 08-06-2008 - 12:50 PM im from bp and you hit the nail in its head most people here or rather in the ultra religious areas from europe, israel to ny/nj think its there way or no way. Im very proud of her and i hope she wins. Its not a chilul hashem - but it is a nebach. Baruch Hashem she keeps kosher and that is a kiddush Hashem. Its a nebach that she is in the olympics though. There is no pride in being in the olympics. I guess the Yevanim won after all. Go Bat-El!!! There is nothing chilul about competing.She's making a kiddush Hashem by keeping the mitzvos that are D'orisa and publicly too! She's more modren than you, that doesn't make her less of a jew. There is pride in the olympics she will represent Israel and that's something! Apparently, there is more to her than just tae-kwon-do, she's in seminary! her yiddishkite has to be challenged?? So many judges so few chairleeders!! Good for her. If that is her lifes purpose then she should be free to fulfill it. Now all the girls who go to satmar school, why are they not allowed to find out what they r good at and go do it. some of them may be good at something other than being a mother. it's a shame that there is so much waste of talent. STOP CALLING EVERYTHING A KIDDUSH HASHEM!!! Hashem is NOT proud of her. A frum jewish girl does not belong performing on the world stage!!! KOL KVUDAH BAS MELECH PNIMAH!!! Um,,,just how do you know hashem is not proud of her? Can you imagine if the story of purim was written on a blog site? I can see it now, many of you would be screaming about the chilul hashem of Esther living with Achashveirosh and this is not the way for a BY girl. (Just a note,,,I am not comparing the stories to each other, rather I am criticizing those who think they know how Hashem reacts to everything). This is why so many kids are going off the derach because like all the responses here everything is assur. Yidden!! The reason why we're in such a low matzav right now is because we negatively judge and dismiss other Jews that are not exactly like us. Instead we should be practicing Achdus and Ahavas Yisroel and start accepting embracing others as simply Jews. to 1.32 is she going to fast t'buv? or she has a heter kudesh hshem? Anon@3:17 - thank you! Just because I don't look like you, or eat what you eat, doesn't make me a bad Jew or a bad person. I think your attitude is commendable and I'm only sorry more people on this blog don't think the same way. is it realy that far that we had come to? is it ""chillel hashem""" or""" kidush hashem """ we all know why we did accept as a jew the mother from our king'' david malech yisruel"even she was comeing from MOHOV and we wasent alowed to accept any body from them is because beth din from smeial h'nuvey said" ISH DORKO LUTZIES VEIN ISHUA DORKO LUTZIES" so how in the world can people be so black folded and even call this a kidush hashem dont you think in the old goods day our G'DOLIM'would say"PORETZ GADER YANCHANIE NUCHUSH"
Please just love your fellow jew and stop being judgmental. Rectify your own shortcomings and don't worry about other's. Please do not pick on this girl. 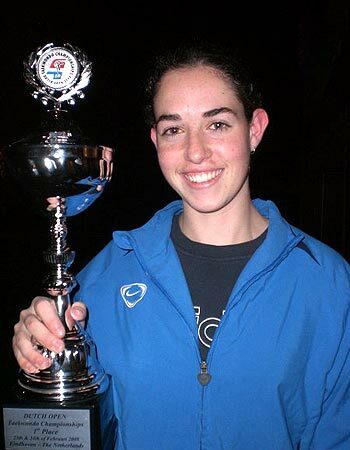 The real chilul hashem is that she is the ONLY one on the Israeli team who keeps kosher and keeps Shabbat. Maybe she can inspire other athletes. keep it up!!! don't let anyone tell you no! she's so young, this is all she's ever known!give her a break. I'd like to hear the sequel of the story in 5-10 years! There are many types of Jews in Israel that have different levels of Hashkafah, in case you haven't realized. Sandy Koufax who was not even Shomer Shabbos gave up a day of playing in the World Series because of Yom Kippur. On his level, it was a Kiddush Hashem. Maybe you could say the same for Bat-El. Maybe it will inspire other non-frum athletes! Gefilte Fish, why worry maybe her future husband will be a karate/judo expert! Seriously it's very nice she's keeping kosher and shabbos and all, but that doesn't justify the lack of tznius, just see or better don't see the picture above. Performing before a woldwide audience with pants which are a clear issur of pisuk raglayim is now a kiddush hashem. How do we know Hashem is not proud you ask, well we have something called the Torah which Hashem gave us and it's all in there, like it or not the shulchan oruch with these halachos is part of the torah so don't give me all this different level stuff, Sandy Koufax was just playing baseball not an issur on a weekday, imagine if some actor/actress who is jewish decided not to stop filming a movie (which is steeped in immoral behavior) on Yom Kippur. Would we celebrate him/her as making a kiddush hashem for promoting immorality as long as it's not filmed on yom kippur! Please all posters if you are writing in english learn how to spell or at least use spellcheck! some of the comments are totally unreadable!! crazy yeden, like you above......and if she wears a skirt it's okay? In general most fanatic jewish minds never like to see another jew succeed....certainly not a women, and nothing or no one in public, it's just another way of holding us down...these type yeden will never say "Good for you, continue on".....It's weird why there are SOOOO many negative yeden. What a role model for our Yidisha Techter!